We are preparing a set of four books, each of these volumes describing one of the four sections of the Musical Kaleidoscope Project. 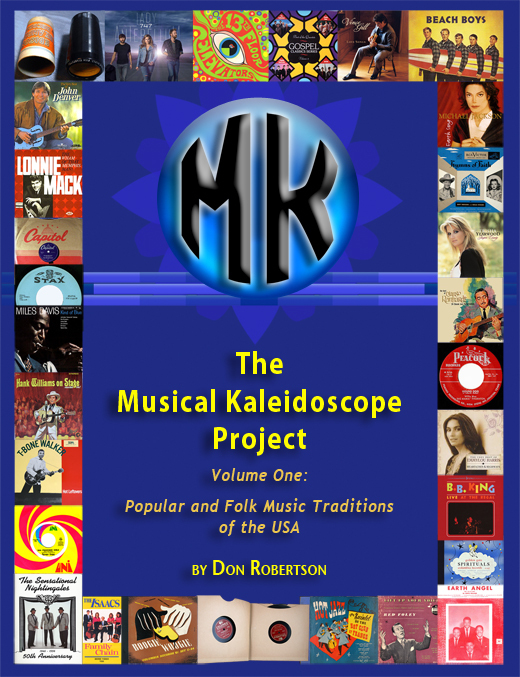 Volumes 1 and 2 describe folk and popular music traditions we have included in the Musical Kaleidoscope repertoire from the musical traditions of Europe, America, and "South of the Border" (South and Central America, Mexico, Cuba and Jamaica). Black Gospel Music - African-American spiritual music originally from the Southeastern United States. White Gospel Music - White-American spiritual music originally from the Southeastern United States. Blues & Soul Music - African-American folk music originally created in the Southeastern United States. Jazz Music - African-American folk music originally from the Southeastern United States. Book 2 - Popular and Folk Music Traditions of Europe and "South of the Border"